Searching for and finding the best directory theme for WordPress can seem like a daunting task. There are quite a few options to pick from, truth be told, and those options are bound to leave you scratching your head as you try to figure out which theme presents the best solution. Our Directory theme has grown to be an industry leader, in part, because it’s not just a simple theme that alters the front-end of your website. It’s an application that provides extensive functionality and a wide variety of flexible features for both the site owners and visitors. There is no sense in pulling any punches here — in most situations, our Directory theme is capable of providing more features and functionality than would be required from any single website. If you try to implement every feature right out of the gate, you’ll probably find yourself overwhelmed. No doubt, there is a lot of effort that goes into building and launching a great directory website. As user-friendly as our theme is, it still take some work to get to the point of a live site. While we’ve already assembled a ton of resources for you, we’re going to take things one step further — making the process of launching your own directory website even easier. We’re planning to step up our content game in 2016. To that effect, late last year we sent out a survey to our members asking what kind of content you would find most useful. We received plenty of helpful replies, and we’re always receptive to additional suggestions — just add your ideas in the comments below. One of the most requested types of content was centered around the idea of creating a directory site from scratch. So, we have decided to do just that. We’re going to create a series of posts that detail the process of building and launching a directory based website. We’re going to start right from the very beginning — installing and configuring the theme — and progress right through to launching a live site. Building and launching a directory website seems like an easy enough process, but there is actually a lot work that happens behind the scenes before a site is even ready for live visitors. The key to building a successful directory website is to begin the process by outlining exactly what you hope to accomplish. You should do this before you even begin to configure your theme. Once you have a plan in place, it becomes easier to stay on track and focussed until your site is ready to go live. If you look at your directory site as a long-term project, you’ll quickly realize that you’ve got lots of time to add features and information down the road. Don’t try to aim for perfection with your first live version. In our next post, we’re going to outline our plan so that you can follow along throughout the process. We think this series of posts will assist you in getting the best results possible from our Directory theme, and hopefully, launch a more successful website as well. In order to kick things off, we thought the best place to start would be to provide an overview of the Directory theme and explain exactly what it’s capable of. There are quite a few things about our Directory theme that set it apart from the competition and it worth taking a few minutes to run through some of the more important features. To begin with, our theme isn’t new. It’s been on the market since 2013 and as a result, it’s seen a wide variety of improvements. Both in terms of core functionality and extensibility via our plugins. When we first launched Directory, we were ambitious with our plans. Now, more than 2 years later, we believe we’ve built the most well-rounded and flexible directory theme on the market. Not only does Directory come packed with standard features, we’ve also created over 25 premium plugins — each one capable of adding very specific functionality. We’ll cover these plugins a little later in our series, just be aware that by no means are any of them required to get Directory up and running. We think the combination of theme and plugins allows our users to customize their site in a unique way that meets their individual needs. You’ll quickly discover that you can create a highly-customized site that performs the exact functions you desire. 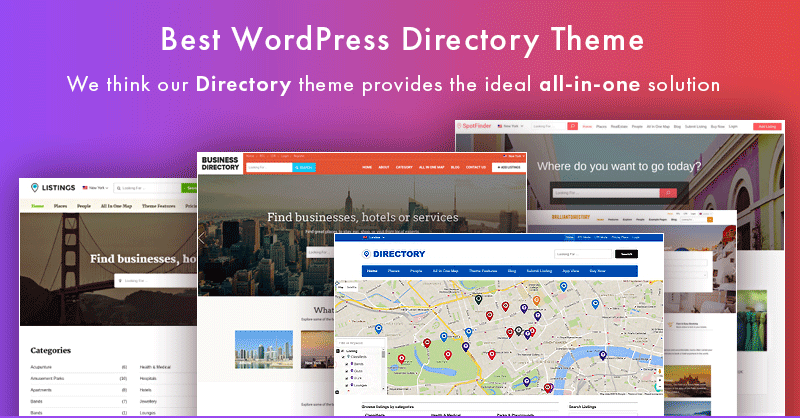 Our Directory theme is specifically designed to help you create, manage and monetize a custom directory website — your biggest challenge will lie in deciding what kind of information you want to present to your visitors. Will your directory contain business listings, tourism locations, dining listings or events? Once you’ve decided what kind of information will be featured on your website, you can then decide upon a specific geographical area. Your website could list every sushi restaurant in North America or it every hostel throughout SE Asia. Or maybe you’re simply interested in creating a local business directory for your hometown. Like any other well-built theme, Directory installs quickly and easily. You can upload the .zip file via the WordPress admin dashboard or if you prefer a more hands-on approach, you can FTP the files directly to your host server. If you’re using a reliable hosting company with servers that are well-optimized for WordPress, you should have no problems with the installation process. Once you’re experienced with the theme, you’ll be able to skip installing the demo data. However, for the first few installations, it really helps to have everything populated right from the beginning. As a beginner, it’s easier to make changes to existing data that to figure out where everything goes right from the start. This makes the process of creating and finding listing much easier for you and more importantly, your visitors. Your website can have as many of each individual item as required. It could be designed for one city that contains multiple categories and subcategories. For example, a general business directory for a large metropolis. Or alternatively, your website could contain multiple cities and only one category, such as a list of hostels in popular tourist destinations around the world. To make your site both visually appealing and provide a positive user experience, Directory present a front-end map with markers that can be clicked. Visitors can find these individual locations in a variety of ways. As the site administrator, you can create your customized listing via the WordPress admin panel. But what would a directory site be without the ability to allow users submit, claim and manage listing from the front end. You want to be rewarded for all your hard work right? When it comes to monetization our Directory theme offers some of the best and most flexible options you could ask for. Not only can you create custom and unlimited packages and payment plans, but there are 16 payment processor options available as well — including Stipe, PayPal, 2CO, Authorize.net and more. In addition to multiple color schemes, Directory also comes with a wide variety of options that let you customize the layout and look of your website. From home page layout to widgets, to sticky headers and custom icon sets, there is no reason why your site shouldn’t look 100% unique. Being unique in appearance is one thing, but let’s not forget how flexible Directory is on the back-end as well. With the ability to create both custom post types and custom fields, you’ll be able to customize your theme to meet your exact requirements. In case time or knowledge are limiting factors, we also provide a unique customization service. Where other theme companies send you off to find an independent developer, we offer the ability to have your theme customized in-house, by the same team who built it in the first place. Everybody understands the importance of mobile responsiveness. While it was relatively easy for us to create a mobile responsive theme, we decided to take things one step further. We provide an option in the admin area that allows you to enable a specific and static app view for mobile devices. No matter what SEO plugin you prefer to use, Directory has got your covered. It’s compatible with Yoast SEO, All-in-One SEO, XML Sitemaps and more which means you site will be easier to rank for your desired keywords. While we have over 25 in-house plugins specifically designed to add functionality to our Directory theme, we knew it was important that our theme played nicely with 3rd party plugins as well. That means your site is compatible with popular choices such as Ninja Forms, Gravity Forms, WooCommerce, Open Table and WPML. At Templatic, we are committed to supporting customers who use our themes. We provide extensive documentation, a support forum and helpdesk. We’ve already put our content plan into action. That means in the near future, we’ll be launching our case study and series, How to Plan, Create and Launch A WordPress Directory Site. If you’ve got some specific topics you’d like to see us address in our posts, please add your ideas in the comments below and we’ll do our best to address them. I would like all the objects inserted (video, photos, etc) were bound to the city, eg. the possibility to insert a video or photo on the home page of the city selected that is different for each city. a very important thing for me would be to put the filter on 3 levels of subdivision, eg. if I choose a city, I see all ads in that city, if I choose a region (state), I see all ads in that region, while if I choose the country, I see all ads in that country. That is all filtered by the 3 lavels. Can I please be included in this case study series. I need help with the set up of this site big time. I have the content that I want. I have the ideas that I want to have and see on my site. I am just not a coder. I have been searching for someone who can help me but There is no one in my area and I really need to get this thing up and running. I would be happy to sacrifice and be a part of this case study as long as I can get this site up and running quickly.